Home / Freebies / Window’s 8 Sweepstakes | Chance to Win $10,000 + Daily Instant Prizes! Now through June 30th you can enter the Window’s 8 Sweepstakes for a chance at $10,000 plus a chance to win TONS of daily prizes! 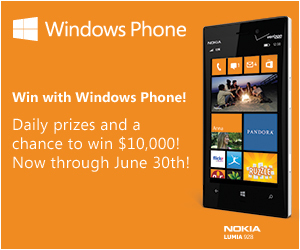 Chance to win $10,000 and 4,000+ daily instant win prizes by simply viewing the new Windows Phone 8 demo! It is the only phone with Live Tiles, designed to keep you closer to what matters most! Enter the Windows Phone 8 Sweepstakes now for your chance to win! Instant prizes are given daily and the more you come back, the better your chances at the cash/grand prize, so visit daily! Good luck!! So get entered today and every day through June30th!